The study area for this IP was the metropolitan area of Ankara. The title of the IP was ‘Sustainable urban regeneration strategies in a major metropolitan area between East and West: The Dikmen Valley and Ulus Historic District in Ankara, Turkey’. Ankara, after its proclamation as the capital city with the establishment of the Republic of Turkey in 1923, has witnessed huge transformations. The city was home to only a few thousand people when it became the capital; but gradually its population has grown at double the rate of the rest of Turkey. It received large inflows of migrants, particularly during the 1950s-60s, who illegally settled on public land. The two case study areas –the Dikmen Valley and the Ankara Citadel– are examples of unauthorized housing and of different strategies to tackle the issue. The Dikmen Valley is located in the Ankara urban core and covers 290 hectares. In the 1980s large-scale urban transformation projects were launched in Ankara, introducing new concepts such as public–private partnerships. The Dikmen Valley Housing and Environmental Development Project was one of the pioneer interventions of this type, aiming at redeveloping an unauthorized housing area with a new management model. A public-private development corporation – an innovation in the Turkish administrative system – was established by the Greater Municipality of Ankara to coordinate and implement the redevelopment project. The project had three goals. The first was to transform the Valley into a recreational area for the entire city. A second goal was to create a commercial and cultural urban node. Finally, the project addressed the squatter housing problem in the area with a redevelopment model based on self-ﬁnancing and participation. The project involved five phases, two of which have been completed so far. At present all squatter houses have been demolished, a huge recreation area has been created and new residential units have been constructed for both the former squatters and high-income newcomers (about 18,000 people). However, the project has also created new contradictions: service areas were limited, and high- and low-income groups living in the Valley do not integrate. Presently, the Valley consists of gated luxurious communities on one hand, and apartment blocks of former squatter people on the other. 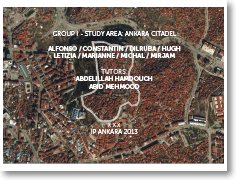 The second case is an urban revitalization process around the Ankara Citadel in the Ulus Historic District. The Citadel Area was also invaded by illegal housing of migrants since the 1950s. After Ankara was declared as the capital city, a modernization process was started in the city to make it the symbol of modern Turkey, but during this process the traditional parts of the city were not given adequate attention and the area became thus home to the migrants. Since the late 1980s, however, the Citadel and its vicinity have witnessed revitalization processes by many different actors ranging from the Municipality to preservation groups. The physical interventions and new functions have transformed the area into a tourist attraction with intense commercial activity. Today, the Citadel area accommodates low-income housing, illegal squatters, craft shops, museums, restaurants and hotels. While being a revitalized historic urban site, the Citadel is not exempt from problems and conflicts: it is overcrowded and congested, with severe transportation problems and environmental issues, low living quality. Moreover, there are many actors with different stakes, including the municipality, preservation groups, shopkeepers and residents. The Dikmen Valley and Ankara Citadel redevelopment processes showcase multiple problems, which are specific to the Ankara context but are also common to many European metropolitan areas and represent, hence, major contemporary planning challenges. Of particular interest are the issues of social, economic and environmental urban sustainability on a local and regional level, which in turn relates to issues of housing, transportation, public space, governance, environmental and historic conservation. Such issues need to be tackled with a multidisciplinary planning approach, to integrate economic, social, environmental and physical dimensions of urban transformation. In the IP, the redevelopment processes at work in the Dikmen Valley and Ankara Citadel were used to discuss the above issues as well as the planning strategies to meet the challenges of sustainable urban development. A critical analysis of such redevelopment processes was deployed with a multidisciplinary approach from the fields of city planning, architecture, economics, sociology, geography and environmental sciences. Such an approach contributed to reveal the complex relations between the physical environment, transformative pressures and governance system and provided a basis for sustainable urban development strategies. 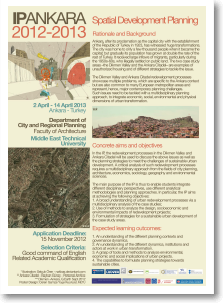 Formulation of strategies for a sustainable urban development of the case study areas. The innovativeness of the IP project lied mainly in its multidisciplinary perspective, in terms of both contents and teaching methodology. Partner institutions shared the same concern with sustainable urban development – a central concern in the European research agenda– and multidisciplinary teaching methodology. Multidisciplinary and multinational staff gave the students access to expertise from other countries/disciplines, that would not otherwise be available at their home institutions, thus providing a broader perspective on the issues at hand. Also innovative was the teaching methodology adopted; a combination of lectures & seminars, field survey, team project work, under close teacher supervision. This approach, coupled with the multidisciplinary and multinational perspectives, allowed for an interactive learning, and for the exchange of innovative teaching methods among staff. An understanding of the different planning contexts and governance dynamics. An understanding of the different dynamics, institutions and actors at work in urban transformation. A grasp of tools and methods to analyze environmental, economic and social implications of urban projects. The capabilities to formulate planning strategies towards sustainable cities. In addition to such subject-related competences, the multidisciplinary and multinational teaching environment of the IP enriched students with a more transversal type of knowledge, enhancing their communicative skills to cope with cultural diversity in an international academic environment. The teaching methodology adopted in the IP was a combination of lectures, fieldwork and team project work. In the first few days, lectures and seminars from staff of the host university and local planning institutions were combined with field visits to provide the students with the background knowledge about the national and local context. Teachers from participating universities provided further inputs about key urban redevelopment issues from different national and disciplinary perspectives. In the second day, work teams were formed to carry out the project work throughout the IP. Each team included 8 students selected on the basis of their preferences, but also with an eye to ensure a multidisciplinary and international mix. In each team 1 Turkish student was included to provide assistance with translation and practical matters. The remaining days were devoted to project work. Each team was asked to analyze one of the two urban redevelopment case studies, identify key issues and formulate planning strategies to tackle such issue from an architectural and urban design, social, economic or environmental sustainability perspective. At least two teachers were appointed to each team to tutor the group in the discussions, the organization of the project, the choice of literature, the collection and processing of information and the formulation of planning propositions, towards preparing the final presentation and written report required at the end of the IP. The ratio of teachers to students (including local students) was, on average, 1 teacher to 3-4 students. At the end of the first week an intermediate collegial presentations and discussion was organized to sharpen the focus and to give further direction to the group work. The remaining days were devoted to the preparations of the written reports and final presentations, scheduled on the last day of the IP. 2 Alessia STELITANO Conservation & Architecture Italy Reggio C.
3 Manuela SARCIA’ Urban Planning Italy Reggio C.
4 Gianluca PATANE Architecture Italy Reggio C.
The students were constantly monitored during the development of the project work and were evaluated collegially by the staff at least twice: at the intermediate presentation of the work project and at the final presentation on the last day of the IP. This first type of evaluation was complemented with an evaluation of the final reports produced by each work team. All the teachers present at the first intermediate presentation and at the final presentation evaluated and marked individual students on the basis of their contribution; all teachers attending the IP read the final reports and marked the team work. An average mark was then worked out, certified by the host university and transmitted to the participating institutions. The IP was recognized as an integral part of the curricula offered by each partner university, either as an independent course or as part of a core or elective course. The total working load was approximately 70-80 hours, which corresponds to 3-6 ECTS credits – depending on national systems. These credits and associated marks were fully recognized by each home university – in accordance with the ECTS metric adopted by each partner university – and officially transferred on each student transcript of records.